Almost every cuisine has its variety of piquant fish… from ceviche to spicy soups to pan-fried fish. And most recipes – even humble fish and chips – can be adapted to add a spice component. This recipe makes an impressive entrée that is easy to prepare, yet elegant in its presentation. Combine the stock, Sriracha, soy sauce, cornstarch, honey, crushed red pepper and ginger in a bowl. Stir well to combine and reserve. Heat the oil in a medium sauté pan over medium-high heat. Add the green onions and garlic. Cook briefly. Add to sauce. Simmer until the sauce is warmed. Add the shrimp and toss to coat. Garnish with chopped green onion. 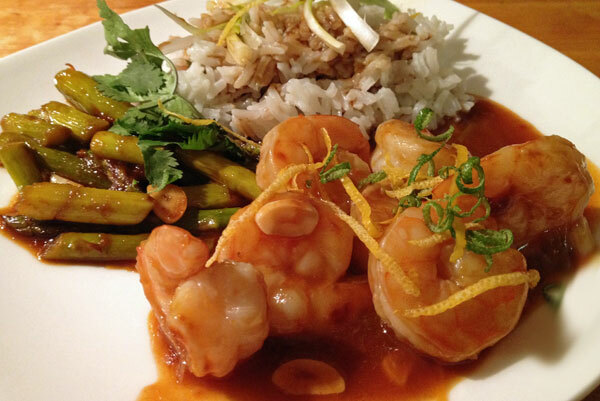 Serve with rice and Sichuan asparagus. Steaming shrimp keeps the flavor of the spices, while boiling shrimp just washes them off. Shrimp cook very quickly, so be sure not to overcook them or they become tough and rubbery. In a medium saucepan combine 1/2 cup water (or beer), 1/2 cup white vinegar and two tablespoons Old Bay seasoning. Put a steamer basket in the saucepan and bring the liquid to a boil. Add the shrimp, cover and steam for three to five minutes, or until the shrimp are opaque. Drain the shrimp and plunge into an ice bath to stop the cooking. Heat a large skillet over medium-high heat. Add the oil. When the oil stops shimmering add the garlic, ginger and Sriracha. Cook briefly. 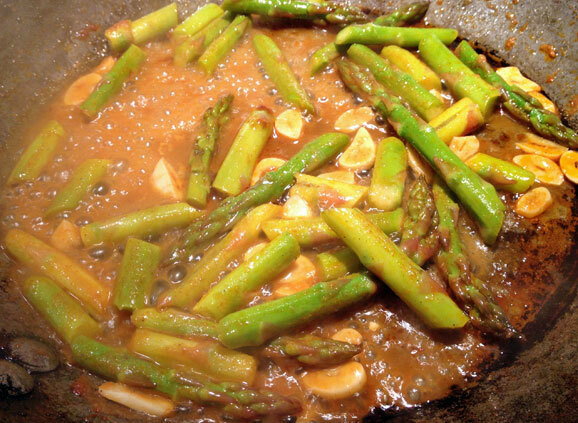 Add the asparagus and cook five to six minutes or until the asparagus is barely tender. Stir in the oyster sauce and sesame oil. Toss to coat.